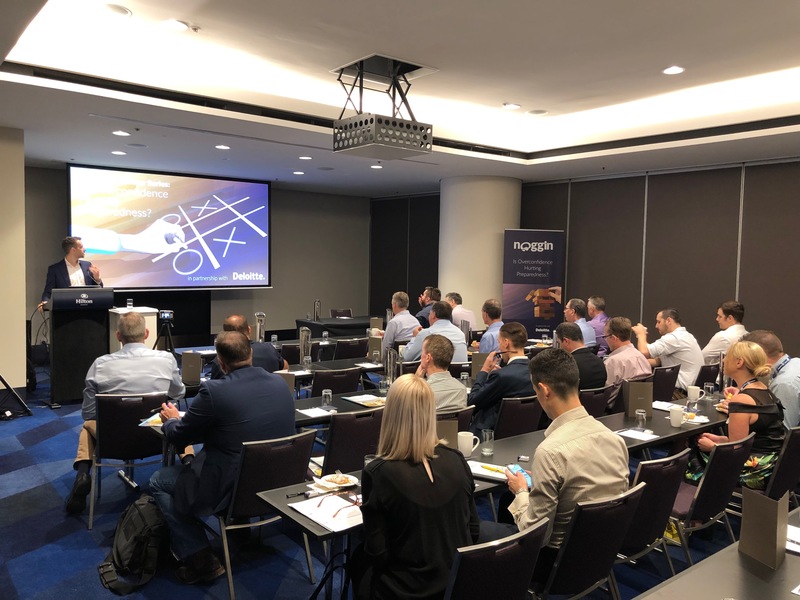 Held first in Melbourne, Sydney and Canberra, the series recently made its way to Brisbane, Perth, and Wellington, bringing together risk practitioners from multiple industries, all assembled to explore new developments in the space and to learn about new innovations at Noggin. The title of the breakfast series, “Is Overconfidence Hurting Preparedness?”, comes from a Deloitte Risk Advisory survey published in 2018. So, to kick things off, we had Garth Adam from Deloitte. He relayed some of the study’s top line findings: the fact that while more than 90 percent of leaders worldwide believe they are well prepared for a crisis, only 17 percent have performed the requisite simulations to ensure preparedness. Next up, we had logistics and transportation leader, LINX Cargo Care Group, represented by Systems & Governance Manager – Health, Safety and Environment, Michael Kemp. Kemp offered a first-hand customer testimonial about its Noggin OCA-based Health, Safety, Environment, and Risk system. LINX Cargo Care Group has been using the solution for a few years now, during which time the company has experienced staggering increases in employee engagement and incident transparency for senior leadership, as well as 500 hours per year in time saved. Then, we previewed what’s coming next with the Noggin 2.0 platform, specifically the latest product developments designed to ensure that the (ever-more) user-friendly solution continues to handle crises and other incidents well into the future. Finally, Channel Sales Manager, Gunnar Habitz debuted Noggin’s strategic partnership program. This initiative is intended to bring risk consultancies, leadership coaches, industry associations, the IT channel, and technology providers into the Noggin ecosystem, via a “triple-win approach.” Often, mid-market customers rely on third-party expertise in incident management; and with our new strategic partnership program, we’re giving those parties a chance to leverage the Noggin product suite to help their clients manage disruption, smarter.